A quote of Vera Rubin‘s, and rather a knowing one. I would argue she gave us the single most important piece of evidence for the discovery of the existence of dark matter. She was an inspiration to many, and I’m sad to say that she passed away last Sunday at the age of 88. This is likely not the only tribute to her that you’ll read on this website over the coming weeks, but here I’m going to take what she said to heart and focus on her work, her data and how it was used to show that there’s much, much more to the Universe than we once believed. I’m going briefly to highlight two of her papers. The first containing just a hint at a mystery, and the second following that thread to a conclusive proof, that something unseen and undiscovered was encompassing every galaxy we see in the night’s sky. Authors: Vera C. Rubin and W. Kent Ford, Jr.
Everything interacts via electromagnetic forces. That was the world view the year this paper came out (there are two other fundamental forces but let’s… let’s just ignore those). One of these statements is still believed to this day, but Vera Rubin basically ruined the other one. Not that she set out to. She set out to do a simple study of classical physics. She just asked the question of how fast the stars in a galaxy (specifically the Andromeda galaxy) rotate around the center. In a galaxy, stars, gas and everything else move in (roughly) circular paths around the center. Gravity is constantly pulling them inwards, but they’re already moving at quite some speed, so their path is bent into an orbit. Circular orbits are the most natural, least energetic form of orbit, which all objects if left to their own devices will eventually settle into. But to be on a circular orbit you need pulled by gravity with exactly the right force, not so strong as to drag you closer in nor so weak that you fly further out. This means if you know how fast something is orbiting, you know how strong the force of gravity is. 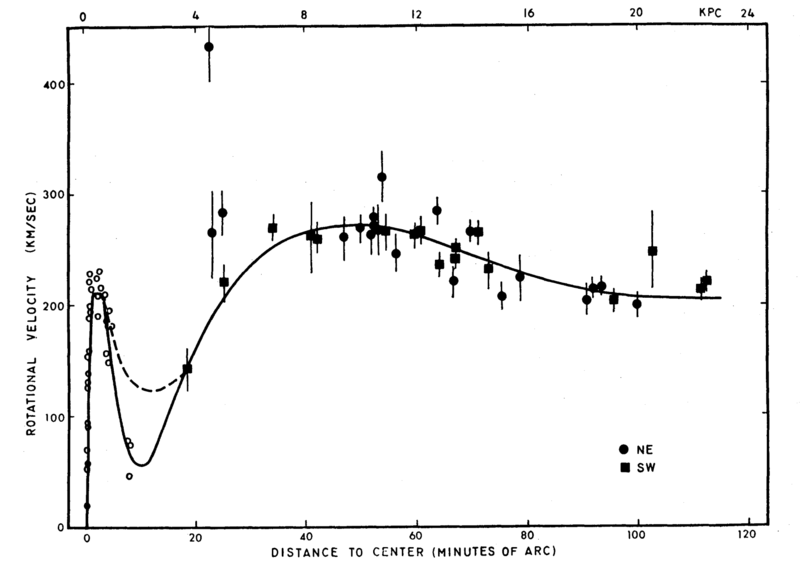 Rotational velocities of H II in Andromeda, compared to distance from the center. For scale on the horizontal axis: 40 arcminutes is the same as our distance from the centre of the Milky Way. The black points are the regions measured and the black line is trying to fit them all together. But that’s not the only way we can calculate the force of gravity. We also have Newton’s universal law, relating the force to the distance between two bodies and their masses. 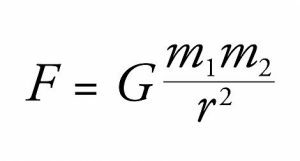 The force between two bodies, F, depends on their masses m, the distance between them, r. G is a constant, the same number any and everywhere in the universe. For a single star orbiting around an entire galaxy the only mass that matters is the mass contained within the star’s orbit (the pull from mass outside of this radius cancels out rather beautifully). That means we can compare the forces, found via the speed of rotation, with the radii, found by actually looking at the darned thing, and find out how much mass there is further and further from the galactic centre. Now, if you look at a galaxy you see stars. That’s not because they’re the only thing there, but because they’re the ones producing light. You might also see the effects of gas and dust, absorbing some emissions and re-emitting others. Thus from the amount of light you could infer the amount of material, and the mass of a galaxy. 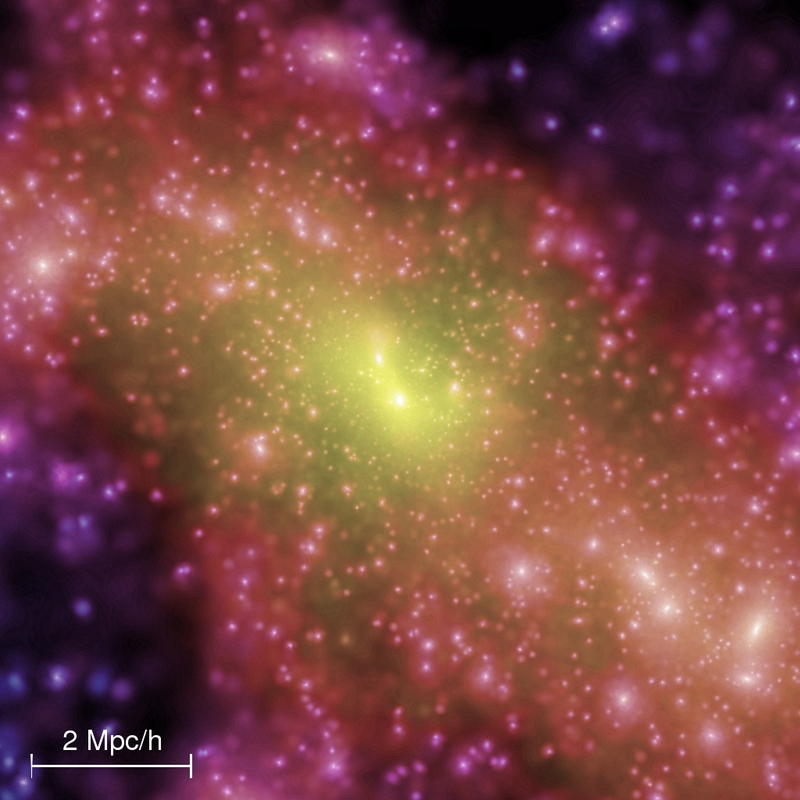 You would conclude that the galaxy is a small blob of mass, around 10 kpc large, sitting on its own. Thus as you get further and further from it, because the mass is fixed and the radius is increasing, the rotation velocities should go down (and quite rapidly!). But Vera Rubin and Kent Ford saw something, very slightly, different. The rotation speeds didn’t drop as quickly as they should. There was something out there, slightly too much mass, at the edge of the galaxy. 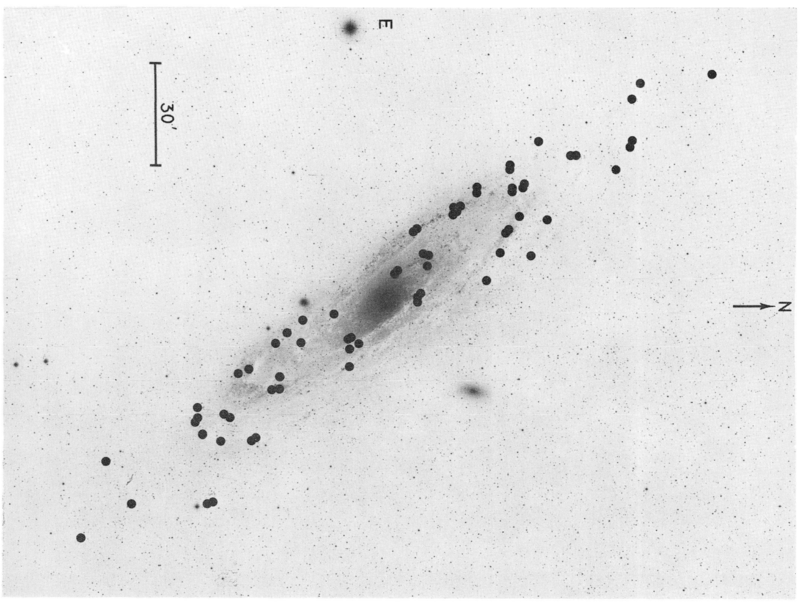 Something we couldn’t see and could not have accounted for when calculating the mass of the galaxy. Here was a hint, just a clue, that something was up. Nothing definite yet. There could be myriad explanations for this missing mass, from errors in the data to just some extra ordinary old gas lingering at the galaxy’s edge. Let’s skip ahead 10 years, to when Vera Rubin’s work took this morsel of intrigue and turned it into conclusive proof that we were missing something. Something big. She didn’t stop working on this in the intervening period, but science can be a slow beast (in fact 10 years is still relatively speedy) and it’s this paper that truly cemented her findings and forced a scientific revolution into motion. What did she do? Well, basically the same thing as before, but better and more. A little extra rotation at the edge of one galaxy can be ignored. It can be swept under the carpet. Some peculiarity at the edge of just one galaxy. But what about clear, unambiguous data from a whole host of galaxies, of all different sizes and types? 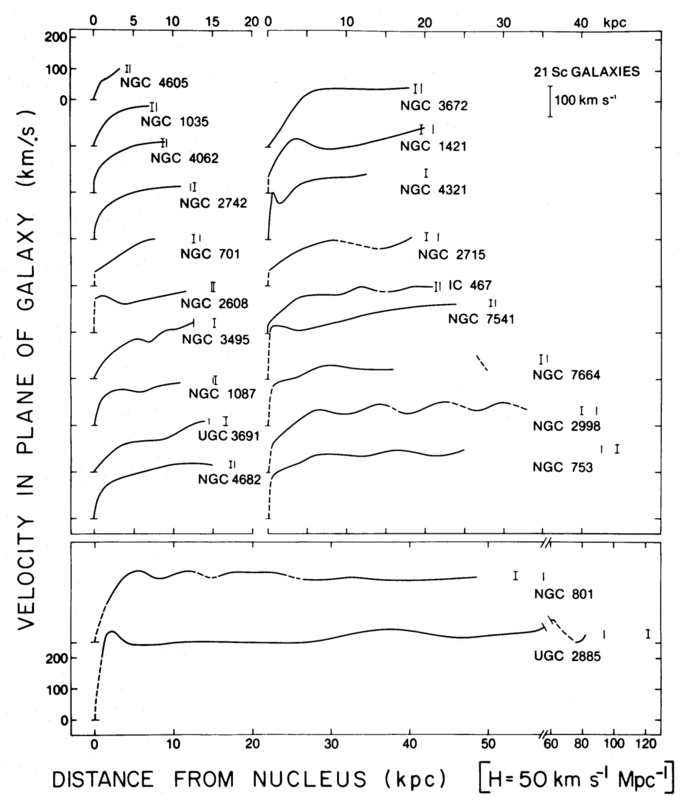 21 galaxies, and each one with a flat rotation curve well beyond the edge of the “classical” galaxy. Beyond the point where stars and gas begin to thin out. Beyond the point where we can see or infer any material at all. And yet, something must be there. Further work, by Vera and others would push this theory forward, refining it and remolding it. Eventually it became clear that the universe had to be filled with this matter, 5-10 times more of it than the ordinary matter that makes up stars, gas and even us. And this matter is not like other matter. For it to escape any other kind of detection it doesn’t just have to be “non-luminous” (emitting no light), but cannot interact with light at all. If it absorbed, reflected or diverted light, we’d see the effects. Unlike every other kind of matter ever discovered, it must not feel and interact with the electromagnetic force. Ironically, for the only thing in the Universe incapable of casting a shadow, it was named dark matter. And we still don’t know exactly what it is, whether it’s some new kind of particle or a placeholder for some quirk in the equations of gravity. 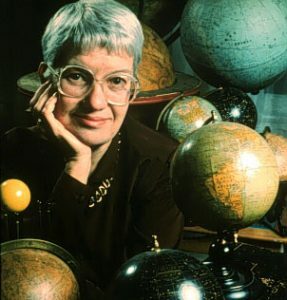 But what is clear, is that it is one of the most important and influential components of the Universe, just as it’s discoverer, Vera Rubin, was one of the astronomy’s most important and influential contributors. 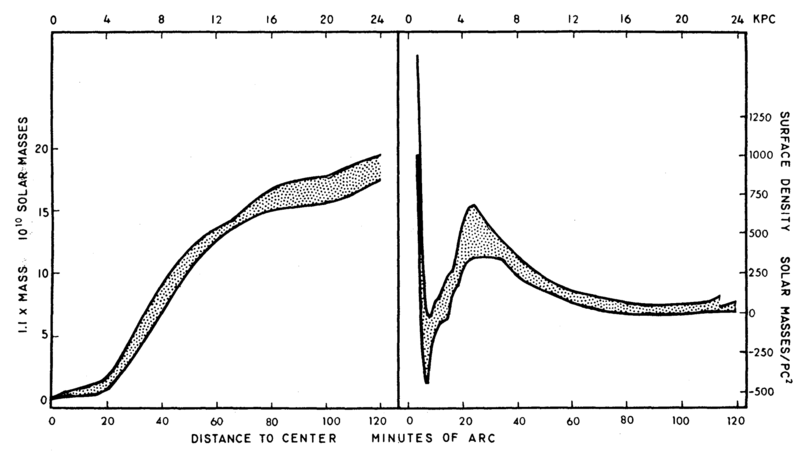 A modern day rotation curve, of the M33 galaxy, where speeds can be found from stars close in and gas far out. The dotted line is the curve we’d see for the mass we can actually observe, and the difference between them, caused by the extra mass of dark matter, is striking. Currently doing a PhD in astrophysics at Columbia University. Zephyr Penoyre grew up in London and studied in Cambridge, neither of which you can see the night's sky from. With maths as a gateway drug he developed a nasty habit for astrophysics. He likes to crash galaxies into each other but polite society dictates he keep such activities confined to theory and simulations. He's often found talking and writing about popular science, windsurfing or doing inadvisable things in far-flung places. Using Clumpy Streams to Detect Missing Satellites Dark matter with microlensing Strands in the Cosmic Web What Can Radio Emission Tell Us About Dark Matter?